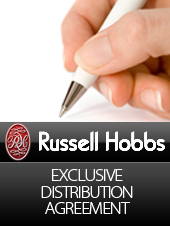 EPE obtain exclusive distribuion deal for Russell Hobbs Cookware to the independent sector. As of June 1st 2010 the entire Russell Hobbs Cookware range is exclusively availiable from EPE to the independent market. This range includes pan sets, single pans, scales, bakeware and pressure cookers. This covers Russell Hobbs Cookware, Russell Hobbs Marco Pierre White Range and Tower Cookware brands. This agreement comes into effect as of the 1st June 2010. Again strengthening and sustaining our partnership with Russell Hobbs, combining the excellence of premium brand manufacturers and the perfect distributor, we predict a prosperous and affluent future on the horizon for this partnership.